STRONGSVILLE, Ohio, November 16, 2017	(Newswire.com) - Fidato Wealth, a Strongsville, Ohio-based Registered Investment Advisor and Wealth Management firm, announced today that two experienced advisers have been added to their growing staff. Founded by CEO Tony D’Amico, CFP®, Fidato Wealth is an independent, fee-based financial advisory firm that provides comprehensive financial planning and wealth management for successful families, individuals and businesses. “We are humbled by the tremendous growth we’ve experienced over the last year. As a result, we have developed a clear focus on three areas of specialization: Retirement Planning, Business Owner Planning and 3(38) fiduciary investment management of Corporate Retirement Plans. With our recent 53 percent growth rate, we have seen the need to continue to be proactive in expanding our team to provide the right team members with the right skillsets to meet the needs of our clients,” said D’Amico. Dave Dorow, ChFC®, AAMS®, AWMA®, Lead Wealth Adviser, brings experience and a track record of tenure and dependability. Dorow will focus on Comprehensive Retirement Planning at the firm. He has over 23 years of experience developing and overseeing financial planning, investment management, estate planning, and tax planning solutions for successful individuals and families. Notably, before joining Fidato Wealth, he worked for the same firm for 22 years as vice president. He is a native of Northeast Ohio and earned his Master’s Degree in Financial Services from the Richard D. Irwin Graduate School at The American College. He also holds the Chartered Financial Consultant (ChFC®), the Accredited Asset Management Specialist (AAMS®), and the Accredited Wealth Management Advisor (AWMA®) professional designations from The American College and The College for Financial Planning. “I joined Fidato Wealth because of its mission to provide fiduciary advice to clients in a way that is unique in the industry, and that offers a true holistic approach to financial planning. I enjoy working with clients, having a great relationship with them, and helping them achieve their financial goals,” said Dorow. Dave Stribula, Wealth Adviser, takes genuine pride in helping people achieve their lifelong financial needs and goals through sound education, dependability and evidenced-based solutions. Stribula will also focus on Comprehensive Retirement Planning at the firm. He has over seven years of financial services industry experience in several roles focused on comprehensive financial planning. He is experienced in investment management and retirement planning for families and businesses. His approach at all times is to build lasting relationships based on trust. He grew up in Northeast Ohio and obtained his Bachelor’s in Finance and Economics from Ohio University. “Prior to joining Fidato Wealth, I spent the last four years living in Scottsdale, Arizona, working in Retirement Consulting with The Vanguard Group. I was drawn to Fidato through an important shared principle; to act as a true fiduciary across all aspects of financial planning and advising,” said Stribula. Fidato Wealth is a fiduciary-based Wealth Management firm, based in Strongsville, Ohio. Tony D'Amico, CFP®, CEO and Senior Wealth Adviser, is an educator and speaker who conducts Retirement Planning sessions at several colleges and other organizations in the Northeast Ohio area. 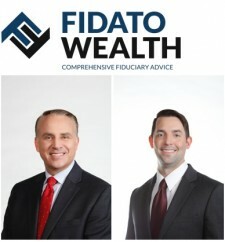 For more information, please visit http://www.fidatowealth.com. Fidato Wealth LLC is an SEC Registered Investment Adviser. Advisory services are only offered to clients or prospective clients where Fidato Wealth LLC and its representatives are properly licensed or exempt from licensure. Past performance is no guarantee of future returns. Investing involves risk and possible loss of principal capital. No advice may be rendered by Fidato Wealth LLC unless a client service agreement is in place with you.